MANILA -- President Rodrigo R. Duterte will be flying to areas affected by Typhoon "Ompong" (Mangkhut) as soon as airport authorities give him the green light. Presidential Communications Operations Office (PCOO) Secretary Martin Andanar made this announcement in a press conference at the National Disaster Risk Reduction and Management Council (NDRRMC) headquarters in Quezon City, noting that this information was relayed to him by the President's top aide, Christopher Lawrence "Bong" Go. 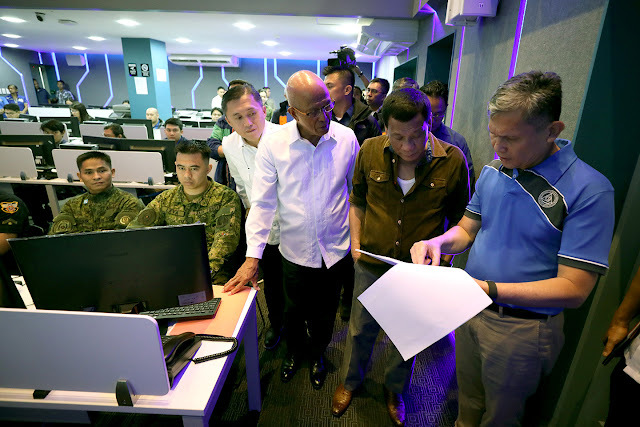 "Oras na magbigay ng go signal ang CAAP ay pupunta mismo, didiretso po ang Pangulo sa mga lugar kung saan talagang napinsala nitong bagyong Ompong (Once the Civil Aviation Authority of the Philippines gives the go signal, the President will head straight to the areas affected by Ompong)," Andanar said. Duterte is currently monitoring updates on disaster response operations. According to the Department of Transportation (DOTr), the three major train lines in Metro Manila are now fully operational despite the LRT-1 experiencing power supply issues later in the day. The DOTr has also provided trucks and buses in Regions 1 to 3 in case there is a need to transport relief goods and evacuees from other areas. Meanwhile, the Department of Public Works and Highways (DPWH) has deployed heavy equipment in areas affected by landslides namely Naguilan, Kenon and Marcos highway. Department of Trade and Industry (DTI) Secretary Ramon Lopez, for his part, assured that goods are still within the suggested retail price and there is adequate supply of rice in Baguio. Department of Social Welfare and Development (DSWD) Acting Secretary Virginia Orogo, on the other hand, reported a total of over 34,808 families affected by the typhoon including NCR, Regions 1 to 3. There are also a total of 711 evacuation centers housing 64,157 individuals.